Lourdes M Supriya (LMS): Could you talk a little about how censorship is an impingement on the rights of the writer? What does it say about our society? Mridula Garg (MG): I was arrested by the police in 1982 for my novel Chittacobra, which was published in 1979. I The censorship of my novel was an impingement on my rights not only as a writer but also as a citizen. I was deprived of not just the freedom of expression but my liberty to live as a citizen. Of course, even in cases where the authors are not arrested but hounded in other ways by the society—having their effigy burnt; publicly abused; tormented at work; having their books banned—the authors are deprived if their liberty as a citizen. They are deprived of the freedom of expression, which is a fundamental right guaranteed by our Constitution. shying away from writing the truth as he or she sees it. In fact, I was told by some of my female colleagues that my being censored had frightened them off writing their novels. This did not happen to me. In the very next year, I wrote another controversial novel, political this time, Anitya (1980). In 1997, a well-known journalist and writer dissuaded Penguin from publishing the book in English, claiming that it was too "philosophical” (read political). It was only in 2010 that it’s English translation was finally published by Oxford University Press. So, the censorship did have an indirect effect on my work. In fact, Hindi scholars keep harping on about the arrest to date, using it to disparage me and my writing. My decision to write the novel, The Last Email, in English (with no intention of rendering it in Hindi) might have been partially influenced by this. Incidents like these paint an ugly picture of our society. It shows that out so called intellectuals are intolerant, regressive, and bigoted. Hardly any of them had spoken up against the censorship when I was arrested. MG: Are things different now? Well, yes and no. In 2014, nearly three decades after the incident, when I read out the “objectionable” excerpt from Chittacobra for a Doordarshan's serial Kitabnama, it was never telecast. However, the interview in which I mentioned the book was. Ironically, it was the interviewer who insisted that I read that particular excerpt, even though I wanted to read from another book. Interestingly, that episode was called 'Women Writers Uncensored' while the original title was supposed to be 'Mridula Garg Uncensored.' At least that's what I was told. things have become worse on other fronts. Caste bias, religious dogma, provincial politics, narrow definition of Hinduism as Hindutva, these are all playing havoc with writers' lives and works. The goons in the street have taken over the censorship of literary activity with full support of the government. Dissent is as little tolerated here as in China. The means of quelling it might be different but not always, as the recent murder of Gauri Lankesh demonstrated once again. LMS: Are there other books (both in Hindi and English literature) that explore relationship, love, and desire in aging individuals, or is your book an exception? MG: I do not know of any such book in Hindi but in English there is the celebrated novel, Love in the Time of Cholera by Gabriel Garcia Marquez. Actually, it was originally written in Spanish. But, since then, it has been translated in all European languages including English. In the book, the elderly protagonists, in love in their youth, get married fifty years nine months and four days but after they were first separated. The man, Florentino, has had 622 affairs in the intervening period. The woman, Fermina, is widowed. Fifty years nine months and four days. in my novel, the protagonists re-open contact and re-affirm their love via email, while continuing in their marriages to others. What they celebrate is a union of spirit and memory without an actual physical meeting. The extent of trust and empathy that the protagonists have for each other is well demonstrated in this excerpt. The woman, Maya is able to talk to her lover Kevin frankly about her intense affection and affinity for a young boy, and he can appreciate it. There are some other novels in English where the protagonists are elderly men and women but usually they are husband and wife. A celebrated one is Kazuo Ishiguro's The Buried Giant. It is an allegorical tale with an elderly couple at its centre. It's a tender love story which deals with the nature of memory and forgetfulness, much like mine. However, in this book, the couple have been married for a long period of time. Some other English novels about long marriages I know of are The Tree of Man by Patrick White, The Rainbow by DH Lawrence, and the Rabbit series by John Updike. All of these follow a marriage from beginning to end, allowing the reader to see the shifts and fascinating complexities in old relationships. But, as you can see, my book is a departure from that kind of text. It does not deal with a married couple but lovers estranged for 40 years and reuniting through words that invoke the intense memories of sexual intimacy without trying to meet again. LMS: What made you write a novel about old lovers reconnecting again? as I grew older, I realised that as far as longing and love were concerned, age was no barrier. All it did was teach patience without dissipating the passion. In fact, I had voiced this sentiment in my novel Chittacobra in 1979. Its young lovers took a pledge to meet after 30 years when they were old and free of social dictates. Here are a few lines from it which clarify what I am saying. "Thirty years more… then I'll be with you." "They will stop feeling threatened if we don't meet for thirty years." "Time stretches on when no moment is precious." "For me each minute will be precious because I'll know you are there"
"Thirty years, only thirty. Then we will have our honeymoon." These lines presaged The Last Email. It had to happen sometime. Poetic justice demanded that it wait for 30-40 years and that was exactly how it came about. Mridula Garg is an Indian author who writes in English and Hindi. She has authored over 30 books. 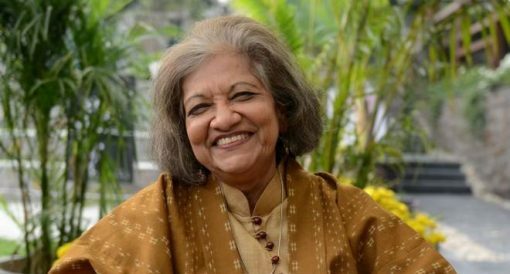 She has been awarded the Sahitya Akademi Award, among others.